Our Foster Dogs are always in need of supplies. Please visit our Amazon Wish List to donate! 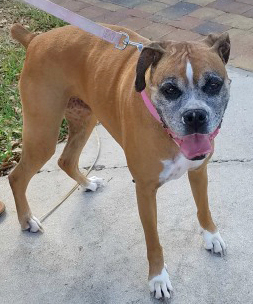 03/01/2019 – Bess is the epitome of a loving senior Boxer. She could not be any sweeter! All her lumps and bumps were removed and none were suspicious. 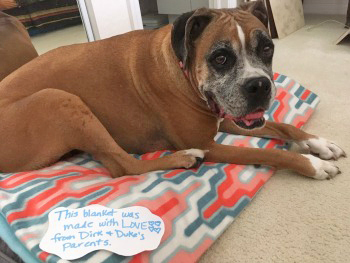 She has lived with other Boxers, rottweilers and greyhounds. Such a laid back sweetheart! 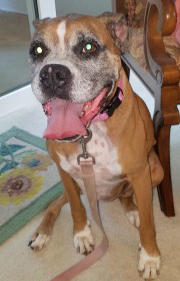 Anyone need a Boxer like this special girl? 02/15/19 – Today was a great day for me! My blood tests came back PERFECT! Not one worm or parasite in my body! I also got to visit a place where many humans live called a nursing facility and they all loved me! I kissed one lady at the door who was in a chair with wheels and we were nose to nose so I couldn’t resist. She seemed so happy I did that! My foster Dad thought my little nub was going to wiggle off with all the wagging I did! I hope they will let me come again. What a great day for me! Good health report and nice visit with lots of people who loved me! Boxer kisses. Don’t let my age fool you! I’m a good girl with lots of love to give to my new family when they find me. I’m waiting for YOU!